Today, Audi has ushered in it's latest incarnation of the brand's flagship with the Audi A8 Hybrid. Powered by both a 2.0 TFSI 4 cylinder and an electric motor, the A8 Hybrid delivers "power like a big V6, fuel economy like a modest four-cylinder unit." Power like a big V6, fuel economy like a modest four-cylinder unit – Audi presents the A8 hybrid as a technology concept at the Geneva Motor Show. Its two propulsion units – a 2.0 TFSI and an electric motor – develop a total output of 180 kW (245 hp) of system power and 480 Nm (354.03 lb-ft) of torque. This enables the Audi A8 hybrid to accelerate in 7.6 seconds from zero to 100 km/h (62.14 mph) and to achieve a top speed of 235 km/h (146.02 mph). Yet its average fuel consumption amounts to only 6.2 liters (37.94 US mpg) per 100 km – the CO2 equivalent is 144 grams per km (231.75 g/mile). The combustion engine of the Audi A8 hybrid is the 2.0 TFSI – a high-tech powerplant. This four-cylinder unit, which has been named “Engine of the Year” five times in a row since 2005, is an example of Audi’s downsizing philosophy. It combines direct fuel injection with turbocharging and the AVS Audi valvelift system, which regulates the valve lift in two stages. In combination with the adjustable intake camshaft, the Audi valvelift system improves cylinder charging and ensures spontaneous and powerful torque build-up. The 2.0 TFSI delivers 155 kW (211 hp) and 350 Nm (258.15 lb-ft); the torque value remains constant from 1,500 to 4,200 rpm. In the crankcase of the four-cylinder unit, which has a displacement of 1,984 cc, two balancer shafts offset second-order inertial forces to ensure virtually vibration-free and pleasantly quiet operation that goes well with the luxurious character of the A8. All components are optimized to minimize friction. The flow-rate-regulated, pressure-controlled oil pump further reduces fuel consumption. A hydraulically operated wet clutch links the 2.0 TFSI with the electric motor. Its control requires the utmost precision, and a great deal of know-how has been expended to achieve its smooth, precise and swift operation. The synchronous motor, which is continually excited, also serves as a generator that develops 33 kW (45 hp) of power and 211 Nm (155.63 lb-ft) of torque. Its full power is available practically right from standstill and contributes to a sportily powerful start-up. Since an electric motor also develops heat, its housing is furnished with cooling ducts. Interposed between the electric motor and the wheelset of the eight-speed tiptronic, which is controlled entirely by electronics, is an additional cut-out clutch. In conjunction with the electric unit, this functions as a torque converter. The propulsive power of both drive systems is applied to the road through the front wheels. Several subsystems that operate on engine power in a conventional car have been modified right from the start for use in the Audi A8 hybrid. The compressor in the climate control system runs entirely on electric power. The steering system is electromechanical as well. The brake booster too is supplied by a demand-controlled electric vacuum pump. During electrical – i.e. recuperative – braking actions, a sophisticated control system ensures that the ABS and ESP functions operate properly. The power electronics unit manages the interaction of the systems. Its pulse control inverter regulates the interplay of the battery and the electric motor. The DC-DC converter supplies power to users on the onboard network. The power electronics unit, which is connected to the battery and the electric motor by high-voltage cables, is located in the engine compartment. The smooth interaction of these components and their high level of integration attest to the specialized know-how Audi has accumulated. The technology architecture already provides a glimpse of a future production model – the Audi Q5 hybrid, which will be introduced later this year. The Audi A8 hybrid, which weighs 1,885 kilograms (4,155.71 lb), drives as if it had a big six-cylinder gasoline engine or a TDI under its hood. From zero to 100 km/h (62.14 mph) the vehicle accelerates in 7.6 seconds, and it can continue to accelerate up to 235 km/h (146.02 mph). Yet its fuel consumption according to the EU cycle is only 6.2 liters per 100 km (37.94 mpg), corresponding to 144 grams CO2/km (231.75 g/mile). In city traffic, the hybrid drive uses about 20 percent less fuel than a conventional drive. Both the car’s performance and its fuel economy benefit substantially from a major advantage of the A8 model series – its lightweight aluminum body based on the Audi Space Frame principle (ASF). The hybrid drive is designed for fully electric-powered driving up to 65 km/h (40.39 mph) and for a distance exceeding two kilometers – especially well-suited for driving in the city or residential suburbs. When conditions permit, the driver can also select the electric mode by actuating a separate e-key in the cockpit. Both the display screen of the instrument cluster and the large monitor of the MMI operating system on the dashboard present all momentary power flows in brilliant graphics. When the Audi A8 hybrid starts moving, both of its engines interoperate closely to suit varying power demands. Above 65 km/h (40.39 mph) the combustion engine alone does all the propulsive work, while the electric motor supplies onboard users and recharges the battery. When the driver lets up on the gas, the combustion engine is disconnected from the drivetrain, so the Audi A8 hybrid ”sails”. In braking and slow-down phases, the e-motor functions as a generator – recuperating energy efficiently and feeding it into the battery. When the driver floors the pedal, the engine management temporarily controls the entire system power, and now the electric motor is boosting power. 180 kW (245 hp) and 480 Nm (354.03 lb-ft) endow the big sedan with enormous thrust. The intermediate sprint from 60 to 120 km/h (37.28 to 74.56 mph) in fifth gear for instance is accomplished in 7.5 seconds. 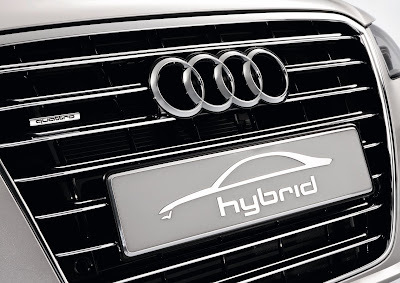 The Audi A8 hybrid is an extremely dynamic car – with a fuel efficiency that is setting new standards. This is especially true in everyday user activities. Even its looks betray the power of this near-production concept car with its big 21-inch wheels and their 265/35 tires. Efficiency and sportiness are no paradox at Audi – they go hand in hand. This near-production concept car has 21-inch, two-colour wheel rims styled with highly three-dimensional surface areas. The exterior paint job of the A8 hybrid is in “Prism Silver” with “Spectra Flair” as an accent color – a rainbow effect that’s accentuated in reflected light along creases and seams on the body. The prominently located “hybrid” lettering on both front fenders leaves no doubt about what kind of car this is. The accentuation of its width by a prominent low horizontal spoiler edge and a chrome strip conveys the vehicle’s solid stance on the road. The engine compartment cover with its high-gloss finish and the glass cover of the battery in the trunk also provide visual links to hybrid technology. And the illuminated doorsteps bear the “hybrid” insignia as an elegant touch to underscore the electric aspect whenever the doors are opened – using LED technology to minimize energy consumption. The passengers also see the prominent hybrid logo displayed on the dashboard. The "Powermeter" in addition shows the energy flow in the instrument cluster.